At any level of basketball, there are great advantages that come from instead of expanding the playbook, growing an offense that consists of 3 or 4 players who all have a wide variety of off-ball scoring actions. Even the most average playmaker, if given a spaced floor paired with screens both on and off the ball will have a very successful time not only getting buckets for all of his teammates but finding situations in which he will be comfortable putting the ball in the basket. Now as effective as scoring actions is what makes them successful is not only having recognition on the floor but giving space. My plan today here is to not only talk about the wide variety of scoring actions, players can do on the floor but where teams can find more space on the floor. 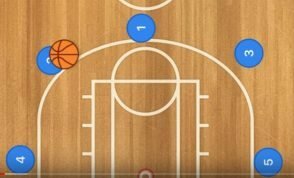 Get the 2018 Golden State Warriors Playbook! The most important part of anything you want to make happen on the floor is spacing. In my opinion, the most important place on the floor starts with where those who do not want to catch and shoot are. People are too athletic and long for both guys to be in the paint anymore, sometimes it is hard for even one guy to be there, 5 outside the paint still is never an option. If the center isn’t starting the possession with a ball screen, I see no reason why they should get down the short corner to start the possession. 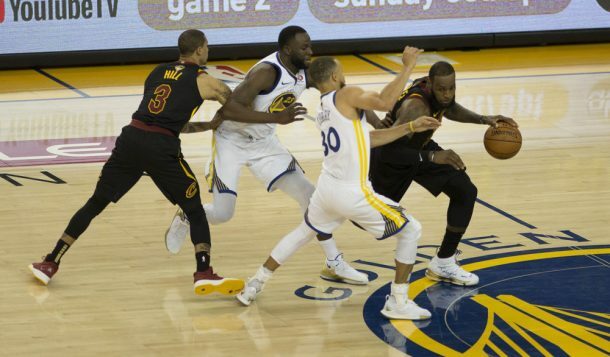 Not only does it give them the opportunity to see the floor, but if they have no intentions of setting screens, you aren’t in the way of anyone, and flashing to the post as the play develops giving themselves the opportunity to pick their spot and get their first is more effective than standing and fighting to keep your position. Another place I find it very important for someone to find is the wing/corner. Not to say both players being there isn’t a bad thing, but the area can be very effective. One thing that is lost sometimes in basketball is it is as much on the playmaker to hit the open shooter as it’s on the shooter to be open and ready to shoot, and that is why even if you are a shooter it is important to never just stand in your spot. Even being some 3 or 4 feet from the spot can be enough to have the space you want to shoot. That way if the play develops fast, faking a back cut and flashing to your spot is nothing to do quickly. What is most important is that the play doesn’t have to develop with the ball handler.it needs to develop around the ball handler, and opportunity can come to a player all night who is effective off the ball. An scoring actions offense puts defenses in situations where decisions are constantly being made. Especially if any sort of defensive scheme is in play, suddenly on every little action that takes place on the floor, the chance of miscommunication or hesitation becomes more prevalent. freeing up the creativity of your playmaker coupled with those he has on the floor. The most important scoring action/way to get open that is not spoken about is screening for someone. This can be a screen that takes place on or off the ball. If you are a shooter, and floating around the wing hasn’t been finding you your shoot, set some down screens down on the post and flashback out. Especially if you have your big man standing in the short corner a screen for them will set them up for a hard flash to either elbow or opposite post, giving you even more space on your side of the floor. Any big man should know that a ball screen set above the three-point line on the ball or not is going to allow for a roll or slip. In scoring options, you will find if you are comfortable on the floor even a step behind is enough to feel open. A very effective place for a player to run with a purpose comes with running along the baseline. Especially when it is paired with a big man who likes to battle down low. If you are a wing who will run the baseline fairly often and get in close with the big men while they get busy. Do not be afraid to bump the defenders in the slightest as you run by. Shoulder to shoulder on a rub will never be a foul as you brush by them, what it will do is make your defender start to have to chase you, and around two bodies can be going a lot of different ways from the baseline. Adding scoring actions only helps you and your post player inside too as suddenly when those rubs start to come that battle inside lightens up as the help for the rub is there. Opening up slips for your teammates as the game goes on or always leaving you in a position with space and time to think. Coming off the baseline can be perfectly paired with any curls, flashes, or even double backs. The most important thing you will find on a basketball court though is that no matter what you are doing, the way to be the most effective is to be deceptive. Whether that be with the change of pace, sporadic decision making, uncanny knowledge of what your teammates are capable of, or just pure athleticism. What having a freely spaced working floor allows you to do is not only be the ones who are in charge of the decision making, but allows you to be free and ready to react properly at any moment.